NEW YORK — Adrienne is walking today because she refused to let a T-4 level spinal cord injury in 2016 keep her down. She says she simply made it her mission to walk again, which she does today with the assistance of a walker. And, when her insurance maxed out and out of pocket costs limited her outpatient physical therapy options, Adrienne decided she would start home therapy by getting grant funding to buy a MOTOmed motor-assisted movement therapy bike like the one she had used during recovery at Burke Rehabilitation Hospital in White Plains. 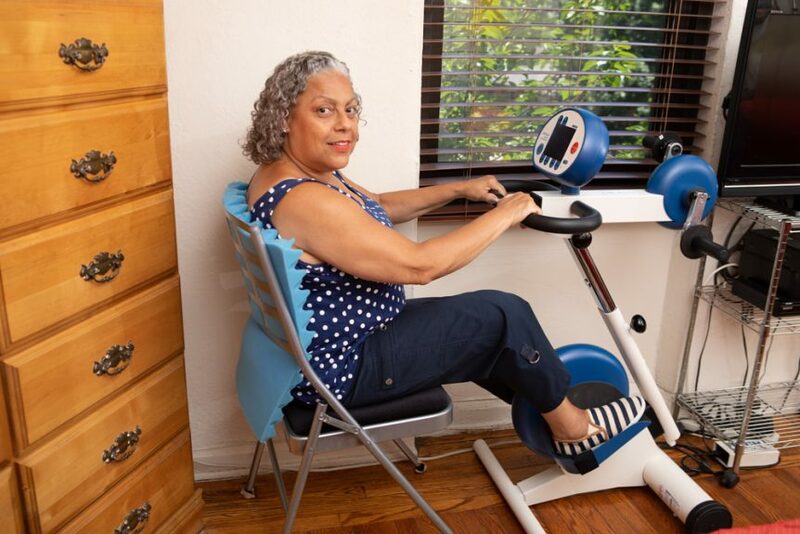 She settled on the MOTOmed Viva 2 Light Bike from Enable Me, the largest provider of technologically-advanced and user-friendly movement therapy devices in North America. At first, it was frustrating and discouraging for Adrienne as foundations immediately said “no,” and she admits to giving up twice. But she was led back to her research and determined to hear “yes.” She began directly contacting foundations and asking for guidance on applications. After getting in touch with multiple foundation leaders and employees, they began to guide her through the specificity of their grant applications. The final cost for her very own home therapy machine, including shipping, came out to $6,530. Adrienne says being specific was the difference, stating specific goals and requesting specific amounts in grants. Proving why you need the grant is fundamental and being as precise as possible can help the approval process. References from doctors and physical therapy practitioners also help tremendously. The average grant application is typically approved or denied in three to six months, and Adrienne was first approved in January. However, most foundations will not approve the full amount requested because of the many applications they receive. “I was fortunate to deal with compassionate people who advised me to apply for more than one grant and guided me on how to apply,” said Adrienne. Joni and Friends Christian Fund for the Disabled in Agoura Hills, Calif.
Triumph-Foundation in Santa Clarita, Calif.
Adrienne was approved for all five from January to May. She approached the final foundation multiple times after the foundation originally looked at approving grants in its home state first. Adrienne was able to receive her MOTOmed Viva 2 Light Bike this summer, three weeks earlier than anticipated. She does not have a set routine yet while she deals with pain from another surgery, but she is looking forward to using it, especially during the cold, harsh winters in New York. She has come far since her injury in 2016, and finds it her purpose to share her story and help others in need through her faith in God. She will only strengthen her journey with the help of her MOTOmed Viva 2 Light Bike. Such an inspiring story from a very remarkable women. God is good!